The Viola Yoga workshop brings forth a unique fusion of Vinyasa yoga and live music. Emily Millen, with her background in figure skating and dance, brings an unusually high degree of grace and elegance to her instruction, while Thomas Beckman, a classically trained violist, uses looping technology to spin a variety of atmospheric and heartwarming beats, as you move through the kryas. 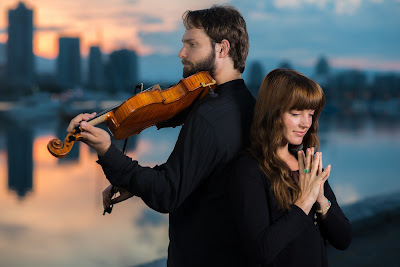 Together, Emily’s voice and adept moves with Thomas’ singing and passionate performances will render a deeply imaginative and freeing experience for all. THIS WORKSHOP IS WILL BE PROFESSIONALLY FILMED FOR PROMOTIONAL USE. THE PROMOTIONAL USE OF THE FILMED MATERIAL.